Angel’s Envy is one of the most sought after bourbons on the market today, and with good reason! The company has a great story, their flagship bourbon appeals to a broad segment of new bourbonites, and the brand shook up the bourbon market with its port barrel finished whiskey. Business has been good for Angel’s Envy. Its sales in 2014 doubled from the year before, and it is positioned to be among the top U.S. craft distillers. It also recently broke ground on a 100,000-square-foot production facility here in Louisville where it will be distilling its own whiskey. 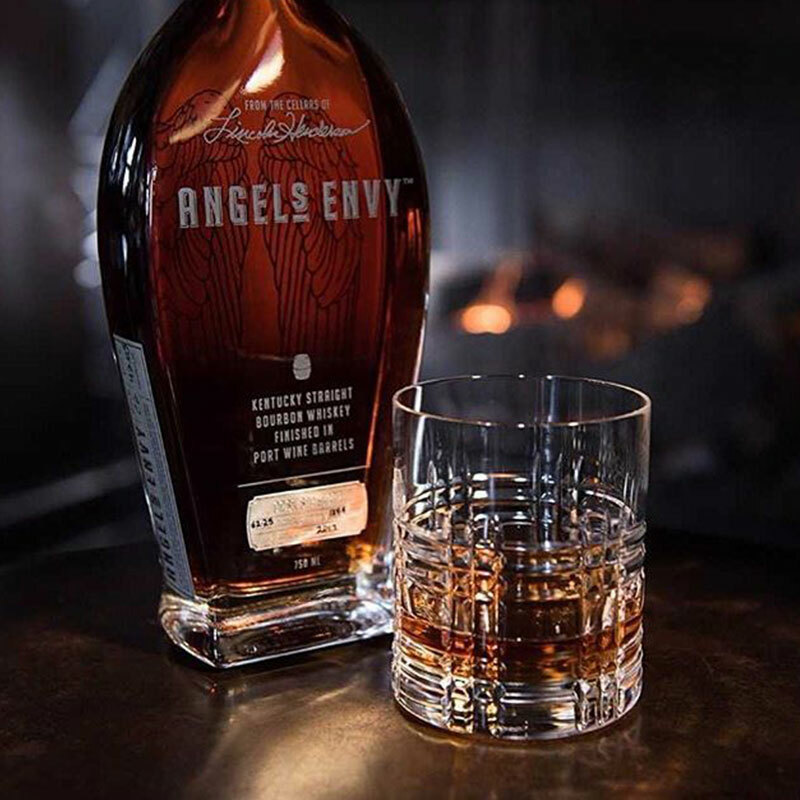 When Lincoln Henderson launched Angel’s Envy back in 2010, he sourced whiskey from other distilleries, hand-blended batches of eight to twelve barrels at a time, and created what he called Expression 10/10 — aging the first releases in oak and finishing it in ruby Port barrels. Although I love Angel’s Envy as a brand, I was still skeptical. Time to put it to the test! For starters, this is a ‘cask strength’ bourbon. What does cask strength mean, you ask? Cask strength, aka barrel proof bourbons come straight out of the barrel and into the bottle. Unlike other bourbons, no water is added to cask strength bourbon meaning the proof can be substantially higher. For this tasting, our bottle displayed a proof of 123. The nose is promising – to be a cask strength bourbon, there is little ether in the glass. Dont get me wrong – you can smell the heat! But some higher proof bourbons tend to give you more of a warning in the nose. Instead, there is a floral bloom that’s heavy on the citrus and spice. Its a pleasant surprise that I didn’t see coming from a 123 proof pour. The first sip burned in a great way, and was all fruit, flower, and spice rack. Cherries, oranges, and honey brings the bourbon to life. Wild herbs add a character that compliments the light body of Angel’s Envy CS. This is an interesting bourbon, but a little ill-structured. For instance, tar seems to hover in the background of my palate. The finish is long and pleasant, but strangely reminiscent of blackberries. It’s heavy on the wood, light on the body, spicy like crazy, and sweet in a way that leaves out flavors like toffee. Awkward description for an awkwardly structured bourbon. As always, it could be me. I had bar-b-que for lunch. But all in all, I found the cask strength interesting and moderately flavored with a kick. I give Angel’s Envy Cask Strength bourbon a B-. See if you can find it in a bar before you fork over $350 for a bottle of the 2018 version. Even if you don’t drink it, it would make a nice addition to the collection. Definitely not the best whiskey in the world. I would reserve that title for Angel’s Envy Rye. Stay tuned for the review on that one! If you enjoyed this article, keep the conversation going! Vote using the stars or leave a comment below. The best bourbon in the world is a rye whiskey? No. I was intoxicated. I thought that was obvious from the slurring sounds I was making as I typed.